- listening to: Athlete - Beyond the Neighbourhood "Hurricane"
It's a beautiful day, Tom is off on a photographic journey in NY and I'm staying home with the kitties. This morning there was a successful trip to the thrift store and now I'm researching plants to fill in our newly patio'd backyard. Right now that's about all I can think about... shrubs, flowers, herbs! I have some before and after photos that I'll show you tomorrow. Well, I seem to be running a day behind on posting items in the Etsy shop this week. 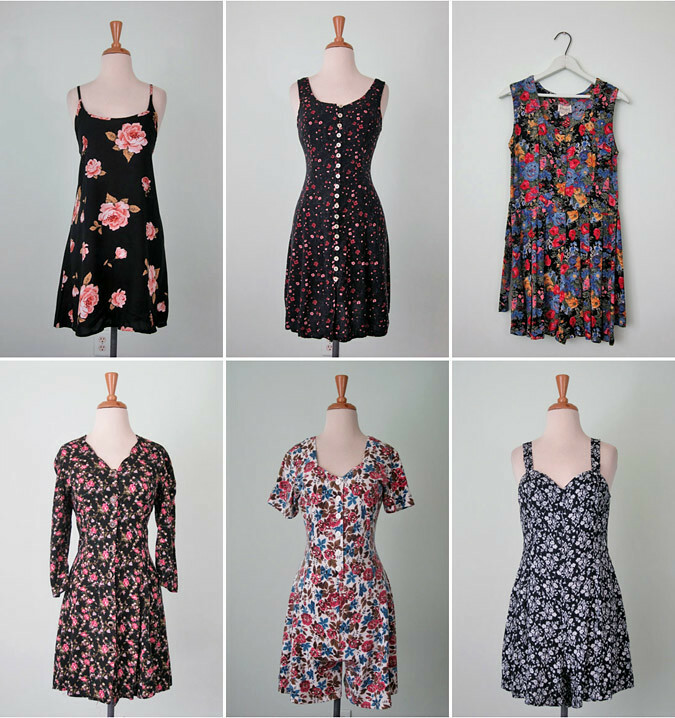 Here is a peek at the dresses I promised you yesterday. I have more items planned for this afternoon, but at this rate it'll probably be tomorrow before they're in the shop! 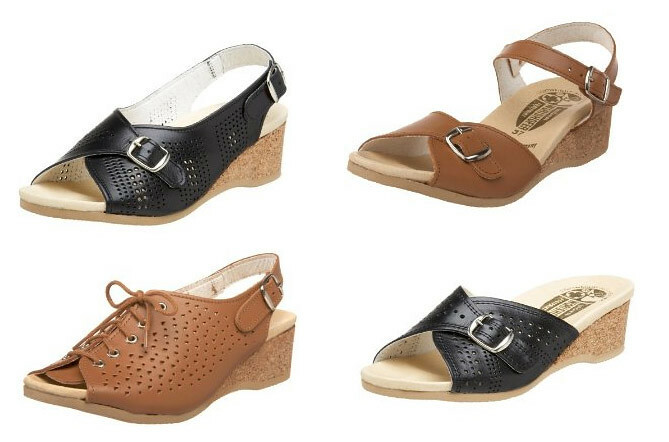 So, I know we're on the down-swing of summer and I'm really not thinking too much about summer sandals right now, but I saw an article on these granny shoes that "all the hipsters are wearing". Mainstream news outlets can be so funny, no? Anyhoo... they're called Worishofers. They're hand-crafted in Germany. And they are extremely orthopedic looking. Maybe you're already hip to these, but my being oh-so-not hip, this is the first time I've seen them. 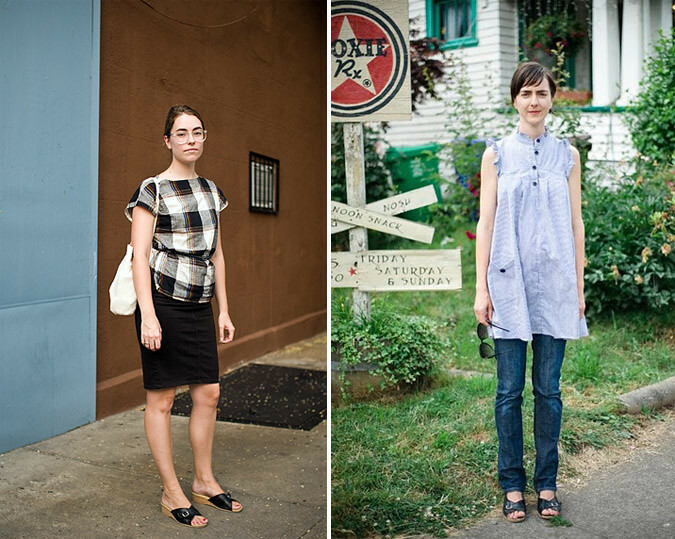 The article I read said they'd been spotted on the likes of Maggie Gyllenhaal, Kirsten Dunst and Michelle William. Now, I don't really follow "celebrity fashion" but if I did, I'm certain these ladies would be at the top of my list. Plus they look darn cute on the gals in the street style snaps above. The jury is still out as far as I'm concerned. They do look awfully comfortable which is more than I can say for a lot of sandals. What do you think? So ugly they're cute? Oopsy! I sort of forgot to finish up yesterday's Etsy items so I'm doing them now. Better late than never right! 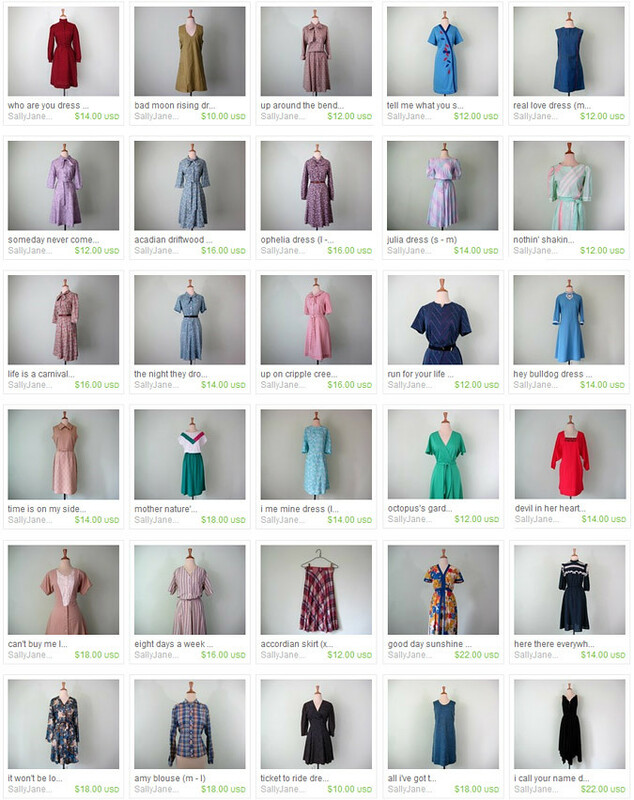 They'll be more dresses added later today. Thanks so much for stoppin' by! 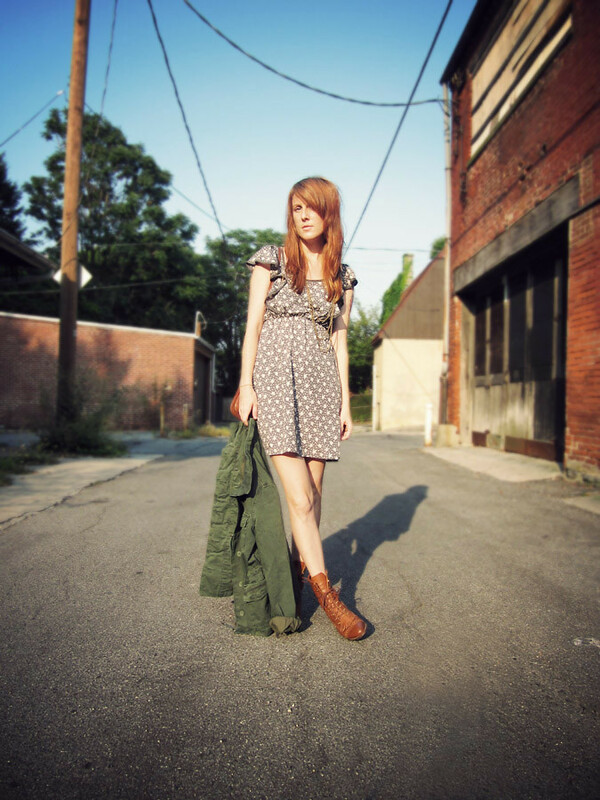 - listening to: Murder by Death - Who Will Survive and What Will Be Left of Them? "Until Morale Improves..."
In case you're wondering, yes, it was a bit warm yesterday to be wearing a jacket. I must admit I think I've been bitten by the "fall bug". I promise not to drone on and on about it. Frequently I get comments like, "why are you always talking about the next season, instead of just being happy with the one you're living now?" Well, that's just the nature of fashion isn't it? Always being a season ahead? Anyhoo... I finally found the perfect pair of boots I was craving. These even have little fringe across the toe which makes me happy. I'm sure I'll wearing them quite a bit this fall (oops, I said I wasn't going to mention that again, didn't I ?). Here are the last photos that I took on my trip to 'Bama. It seems like so long ago that I was there! 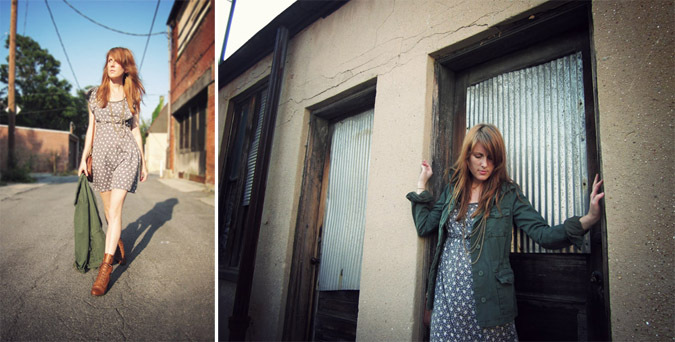 I remember being awfully hot and sweaty when I was trying to take these photos. And also constantly being attacked by bugs and briars. Speaking of bugs and briars... our backyard has been an unruly mess of weeds and a haven for wayward squirrels ever since we moved in late last summer. We've been dreaming of have a nice backyard patio ever since. This week it's becoming a reality! The landscapers showed up early this morning (thank goodness it's not quite so hot today) and by the end of the week we should be eating dinner al fresco on our new brick patio. I already saw that my garden box has been installed so next summer we'll have fresh peppers and tomatoes right out of our own backyard! That is, if I'm actually able to grow any. Forgive my rambling... I'm just quite excited about the new backyard. So, did anyone catch the Mad Men premier last night? I won't give anything away for those of you who haven't yet seen it, but we really enjoyed it! I love that you can see the style advancing a bit. A new hairdo for Peggy, a new dress for Joan, a fresh color scheme in the office. The details of that show have always astounded me. I can't wait to see where this season goes. This week you gals are oh-so-lucky! 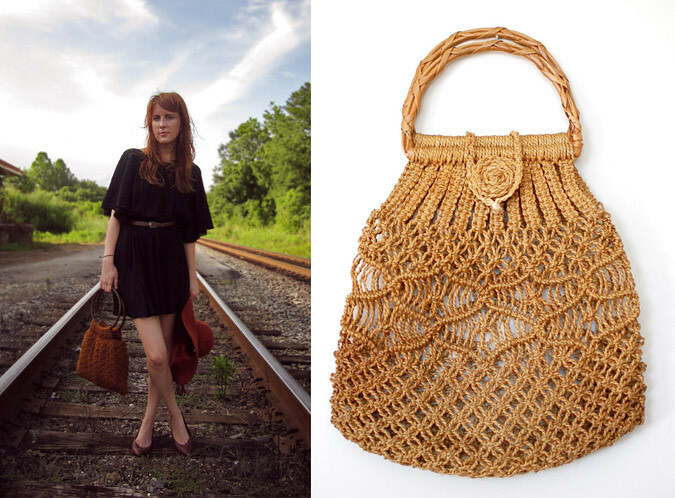 Megan from 13bees Vintage has generously offered up this lovely 1970s jute rope macrame satchel for one of you to win! 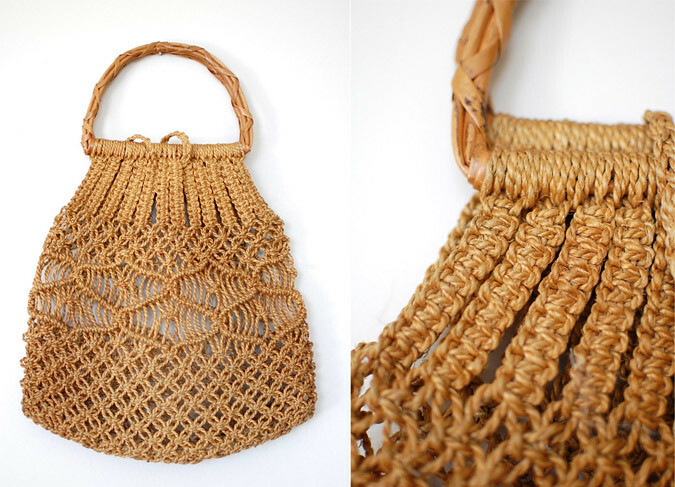 It has woven bamboo handles and a large button and loop top closure. 13bees is one of those Etsy shop where I'm always coveting one this or another. I visit this dress, just to ooohh and aahhhh, on almost a daily basis! When deciding just what to giveaway, Megan noticed I was carrying a very similar bag that I thrifted on my recent trip to Alabama. It's quickly become one of my favorites and I've been carrying it pretty much non-stop since I found it. It's so perfect for these steamy days we've been having. 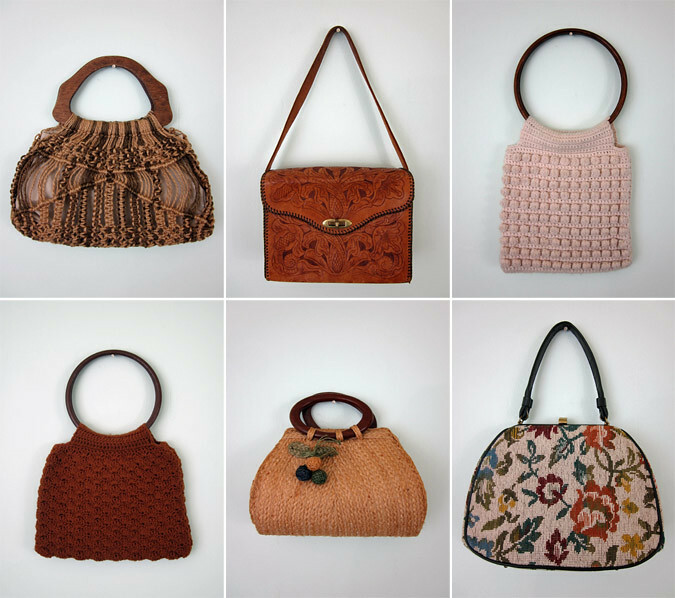 For a chance to call this bag your own, just click on over to 13bees Vintage and have a look around the shop. Pick your favorite item and leave a link in the comments of this post. Good luck picking just one item! Several collections' lookbooks have caught my eye lately; some for summer, some resort, some for fall. That is probably a good indication of where my head is right now... sort of all over the place. 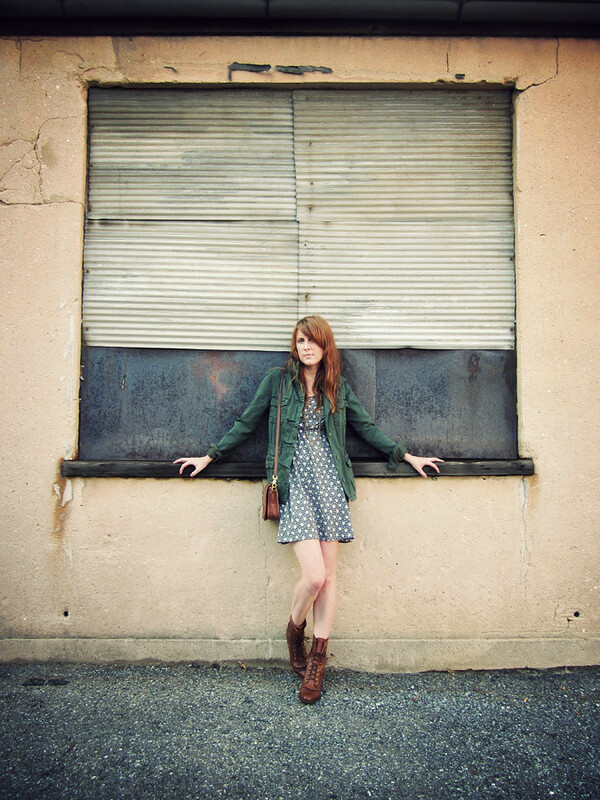 I'm still perfectly happy in my summer sundresses but I'm also pretty excited about looking at fall clothes too. 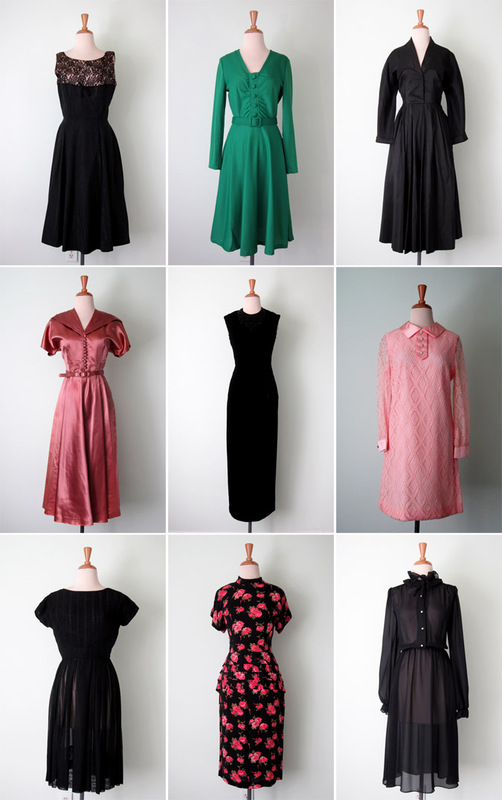 Here's a little round up of the collections that I fancy. Above is myPetsQuare which is probably my favorite of the bunch. The clothes seem infinitely wearable and comfy. I'm definitely looking to pull off that khaki shorts/striped shirt combo with things I find at the thrift store. Below is a preview of the fall Orla Kiely collection. This is one that I look forward to every season and it never disappoints. I haven't studied it too much since it's for fall, but I'm sure I'll be revisiting it once the weather cools. I've written about Paper Cup before, but I've never seen the clothes on a person before so it's nice to see them on a human form. 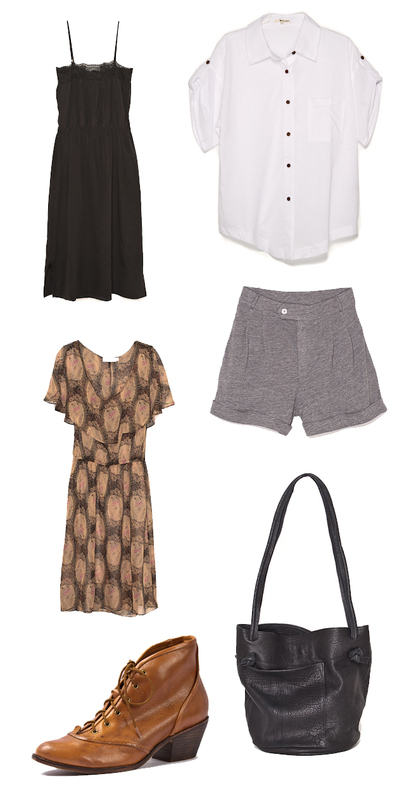 I like the dresses and the separates in this collection. I've never paid much attention to Rebecca Taylor before but I do love the styling in her resort collection. The pieces come off as vintage without looking dated or costumey. I don't really like the striped sock/clog thing that's going on but the rest is quite nice. Especially that first look. Lastly, there is the Chalk collection hailing from Singapore. The pieces were inspired by Louise aka Miss Pandora. I think the glasses give that away! I like the striped pieces the best. Here's a sneak preview of the items I'll be adding to the Etsy shop today! 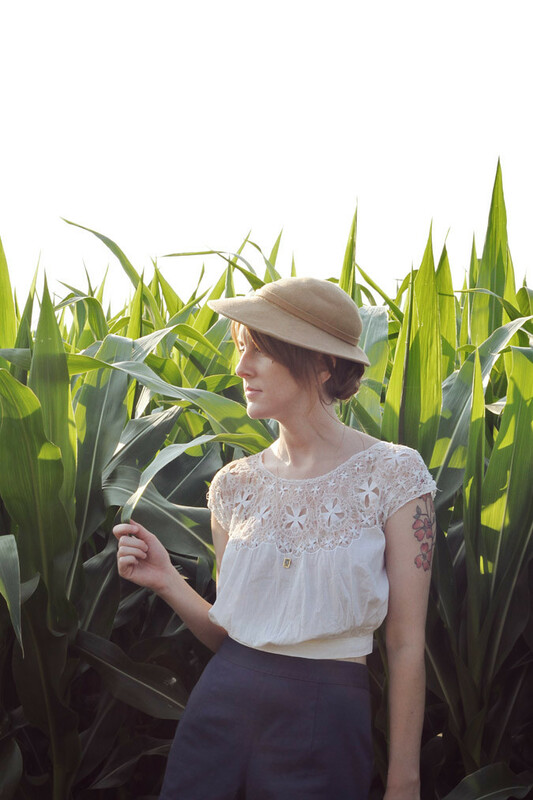 The Dissolution - Trailer 1 from Ellen Rogers on Vimeo. 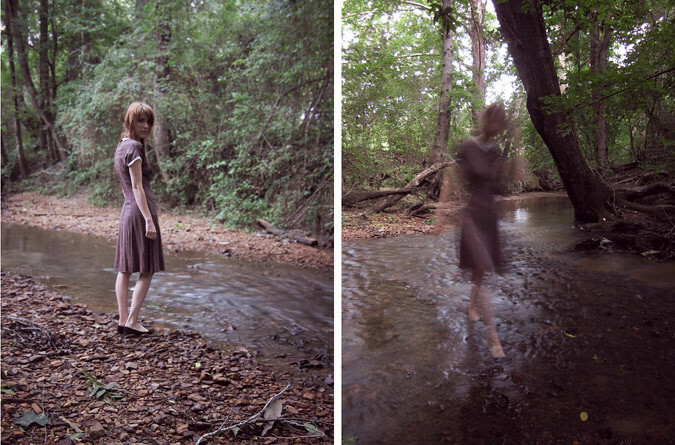 The Dissolution is a collaborative project between Artists Ellen Rogers and Prizme, the objective of which is to collect a series of mediums, which would normally be consumed separately, into a single entity. Each medium is built around a short film of the same name created by the pair as a keystone of the project. These include a booklet (containing a series of photographs), a full album (containing music from the soundtrack), a fold-out poster all bound together in a weighty black foil-blocked and embossed card. The drive behind this project is the desire to create something that would allow the viewer to become further immersed in the worlds projected throughout the work of the two separate artists. At the same time the piece serves as a landmark project in the building of a creative partnership that continues to grow. This adorable video was made by Lalouka featuring her very own designs from her Etsy shop. I love the Alice in Wonderland feel of the whole thing. 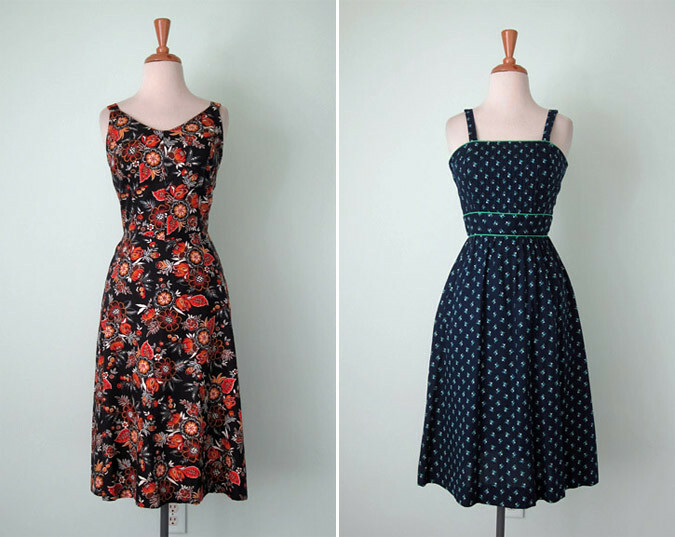 Looking at her designs makes me think I should get back to sewing! If you like the video Lara would very much appreciate hopping over to Talenthouse and giving her a vote! Here's a little peek at the items I'm working on adding to the Etsy shop tonight. - listening to: Television - Marquis Moon "See No Evil"
Being down in the country with no internet access was certainly refreshing. However, it also pointed out just how reliant I am on have instant information. Whenever a question pops up that Tom or I don't know the answer to we, of course, Google it! Several times during my trip a question would pop into my head and I'd want to know the answer right now. Well, there was no "right now" to be had. Patience is a virtue! Instead, I ended up with a rather silly list of things to Google once I got back to internet-land. Can I grow black beans in Pennsylvania? Is the full moon on the same date all over the world? Where can I buy Lady Liberty overalls? What is the history of kudzu? Can I make my own seitan? Is Jame Franco really on General Hospital? What is a basking shark? Now you know the innermost workings of my mind! When packing for this latest trip, my first concern was making sure I absolutely did not have to check a bag at the airport. Whatever I was carrying was going into a bag I could carry on the plane with me. That meant packing light. Luckily, the hot weather makes that a bit easier! All I ended up carrying was a pair of denim cutoffs, a couple of tank tops and three lightweight dresses. Throw in a pair of flats and my Chucks and I was done. 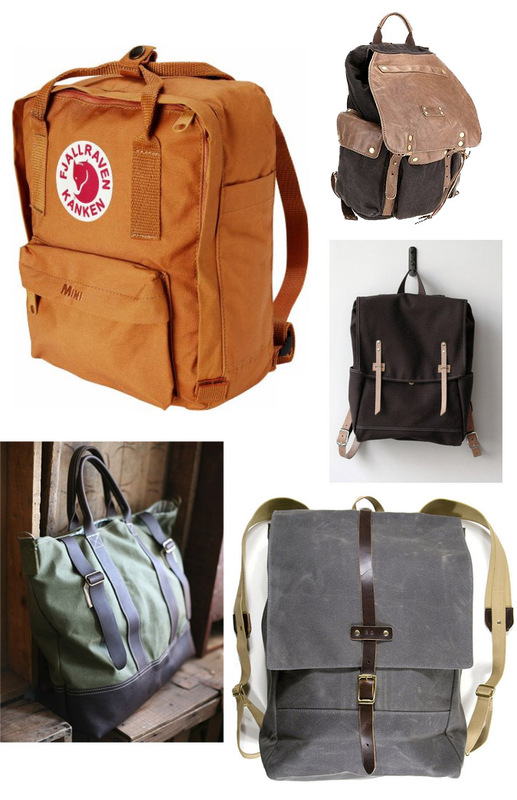 I have a perfectly sensible backpack that held everything nicely but wouldn't it be fun to carry one of these? 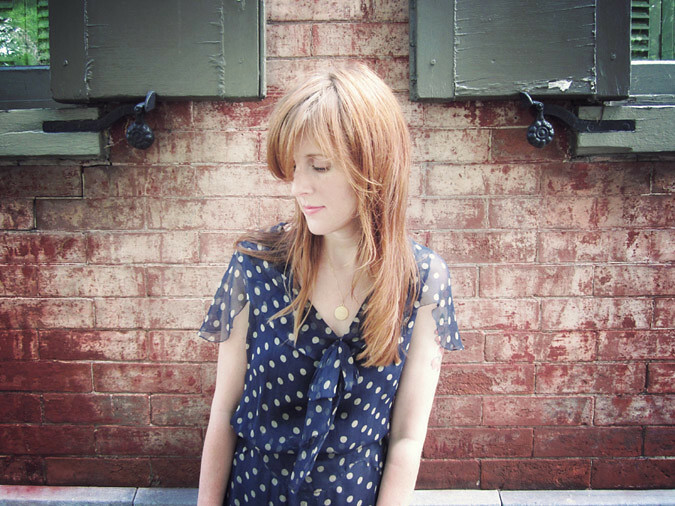 - listening to: Roddy Woomble - My Secret is My Silence "I Came In From the Mountain"
Today I'm heading back home to Pennsylvania. What a wonderful week I've had! Being away from the internet every once in a while does a gal good, ya know? I always wonder if I'll have a hard time adjusting to being back in the South, but before I knew it I was breathing the humid air and droppin' my g's just like I'd never left. This trip was filled with spendin' time with family, pickin' peas and beans in the garden, eating said peas and beans for dinner, antique huntin' and just generally layin' around. Pretty much heaven! These photos were snapped on Saturday afternoon (I think - the days all sort of ran together) just before a thunderstorm came rolling through. There are two creeks that run through my parents property and it's one of my favorite spots. There are always lots of animal tracks to inspect along the banks and we've always got our eyes peeled for the occasional arrowhead that will wash up after a rain. Hi y'all! I'm still hanging out down south and will be until the beginning of next week. 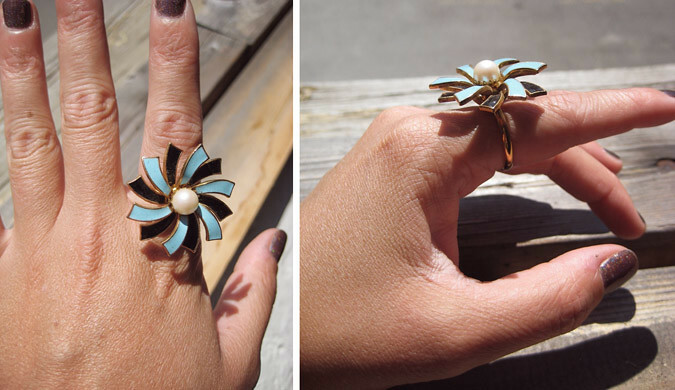 While I'm away Fidget Finds is offering up this pretty vintage cocktail ring to one lucky reader. 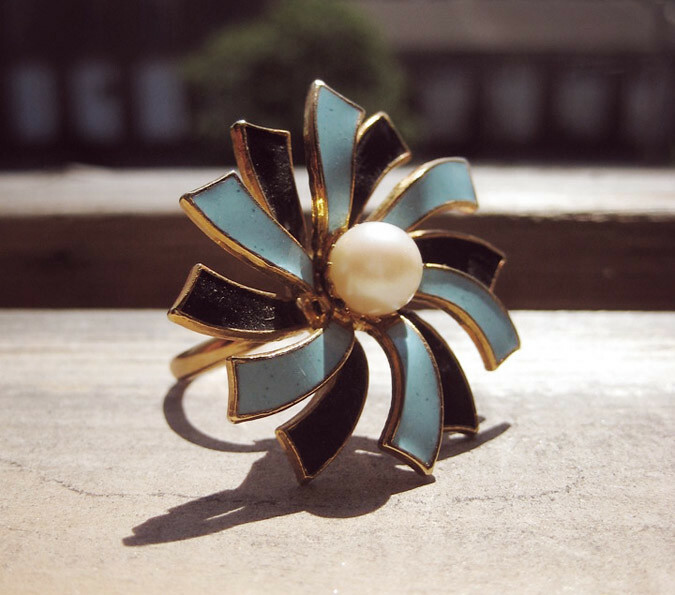 The ring features blue and white petals with a faux pearl center. Best of all, it's adjustable so it should fit just about everyone. Among the many things I've been doing during my stay in Alabama, I've been hitting up lots of small town junk shops searching for treasures. The South seems to lay claim to this unique type of shop... something I haven't run across in any other part of the country. 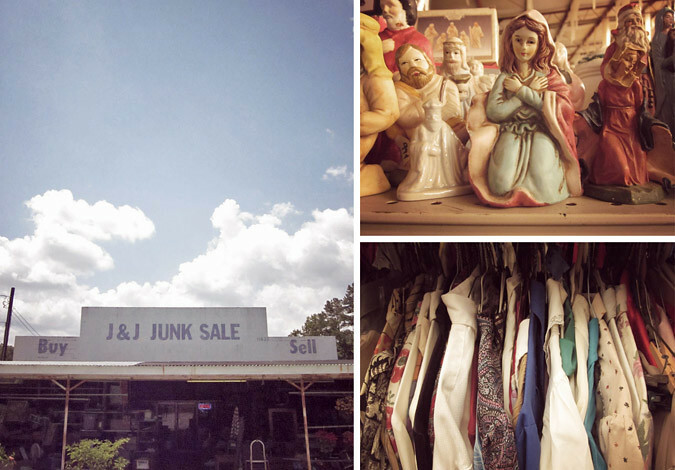 These go beyond thrift stores. They're not charity shops. They're just... junk shops. Need a pencil drawing of a Nascar driver? They've got you covered. Need a box of fake fingernails? Yep, they've got that too (I spared you the photo of that one). An old kitchen sink? I'm sure there's one lying around somewhere. But among the junk there are certainly treasures to be found. 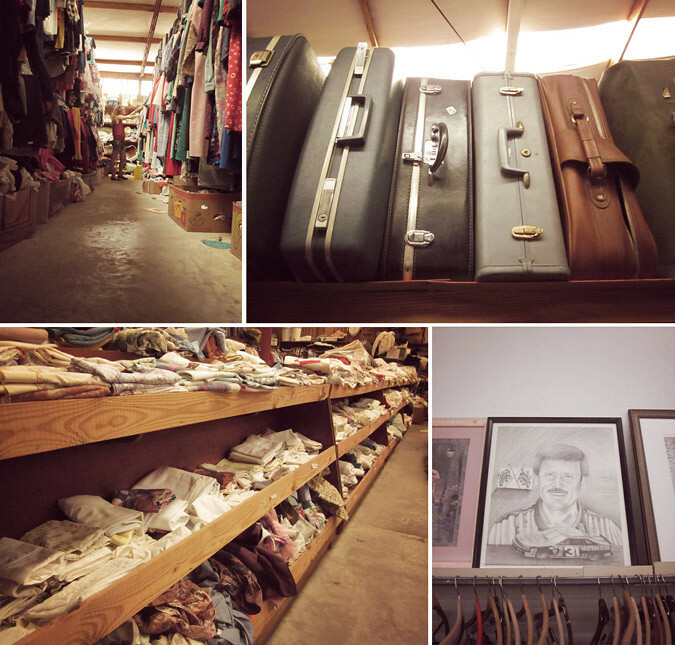 In the back of this shop, we found a warehouse full of old linens, old clothes and shoes, suitcases, dishes... pretty much every kind of junk you could think of. It was hot as Hades (no air-conditioning on a typically hot Southern day) but my sister (that's her in the photo) and I braved the sweltering conditions to rummage through the piles. 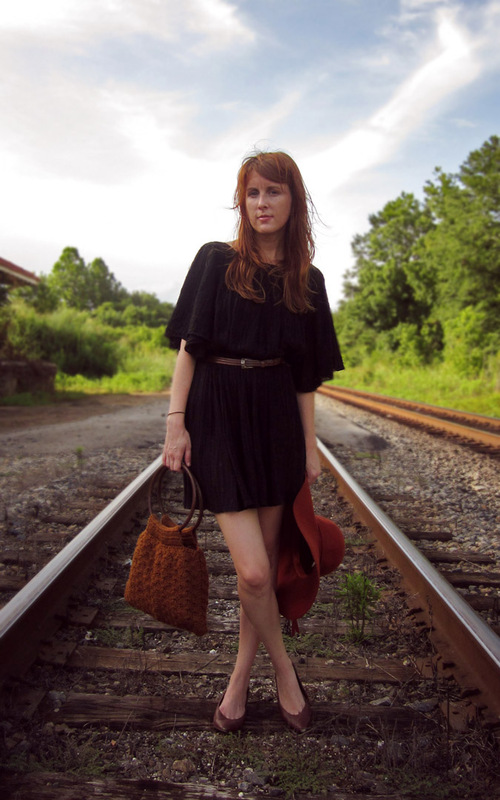 At the end of our many stops in towns with names like Sylacauga and Childersburg, I had collected a bag full of vintage dresses for the shop, another floppy wool hat for myself and a piece of cream colored pottery to add to my collection for the dining room table. I've discounted more than 40 items in the shop! Everything in the sale section is less than $20. If you've had your eye on something, now's the time to snag it. Stop on by and check it out! Thanks so much! - listening to: Guns & Roses - Appetite for Destruction "Sweet Child O' Mine"
After some pretty gnarly delays yesterday, I've finally arrived in Alabama. The weather kept me stranded at the airport for oh, about 13 hours or so. Thanks Mother Nature! I seriously could have driven and gotten there sooner. Well, at least that's all behind me now. With all the airport-sitting-around-boredness I don't have any photos of the trip to show you so far. Instead I'll share the last photos I took while I was still in Lancaster. These were taken on yet another scorcher and I was trying to find a way to beat the heat. Remember the other day when I mentioned that I was keeping a little secret? One that I couldn't say quite yet but I'd tell you about soon? Well, today's the day that the cat's outta the bag! 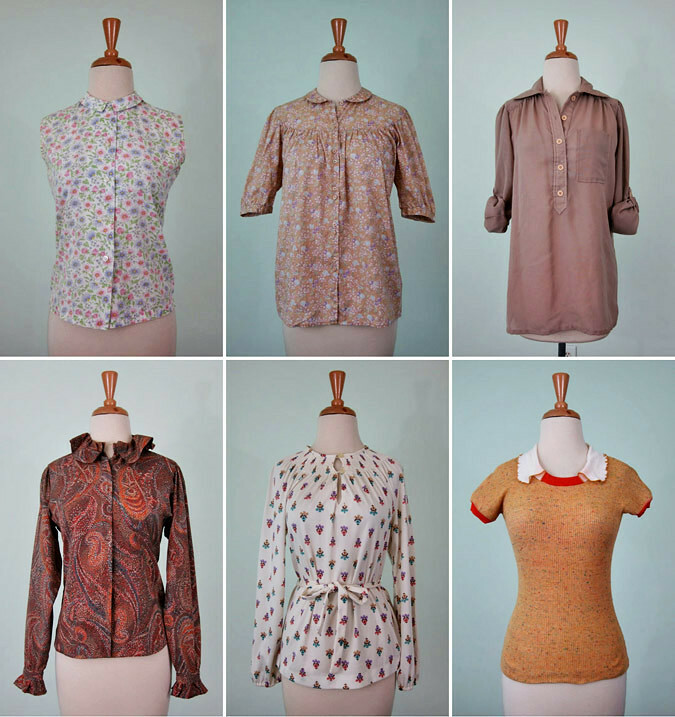 I've teamed up with one of my favorite local vintage sellers, Kris from Smilin' Gal, to create an Etsy Collective shop. 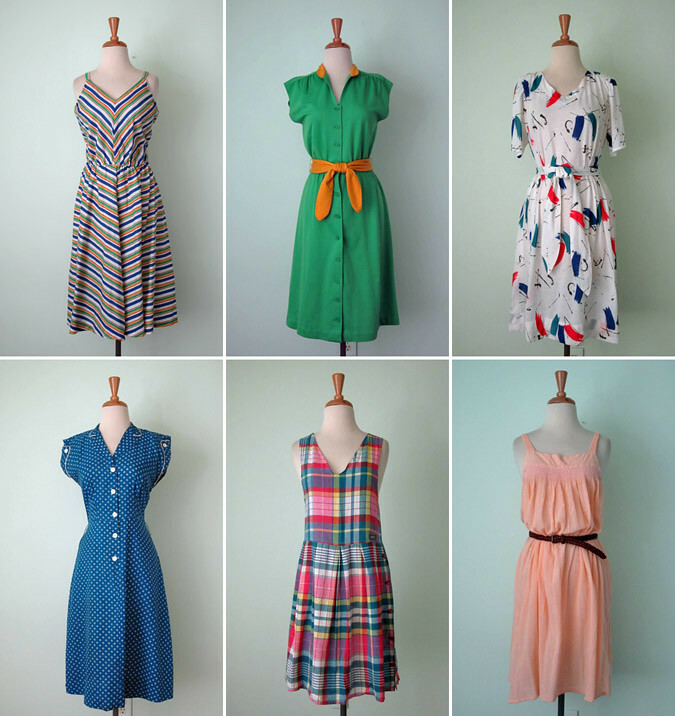 This means Kris and I are teaming up to bring lots of amazing vintage dresses to the SJV Etsy shop. You may be familiar with Smilin' Gal from reading my blog. 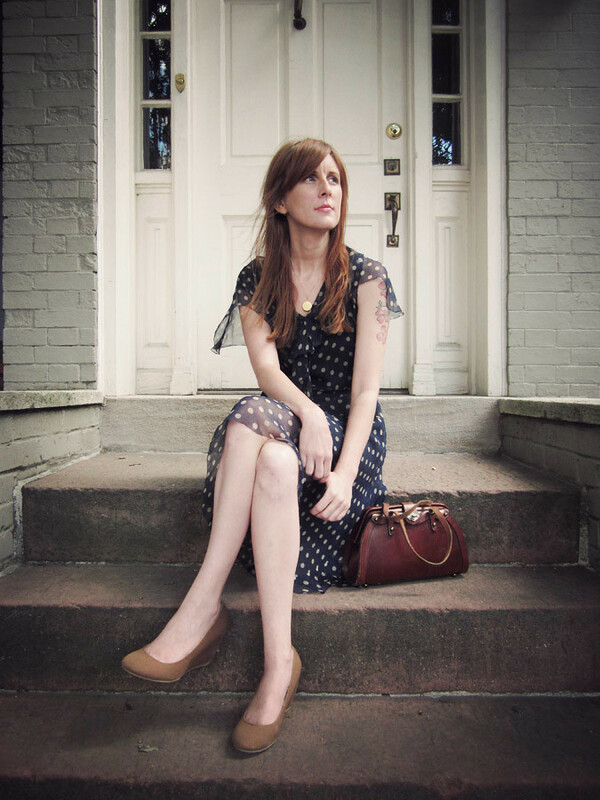 It's where I found this dress and this dress. It's also the shop where Andreja and I often go shopping when she visits. Every time I'm in Smilin' Gal I find something that I just neeeeed to take home with me. And now you can take something home too! 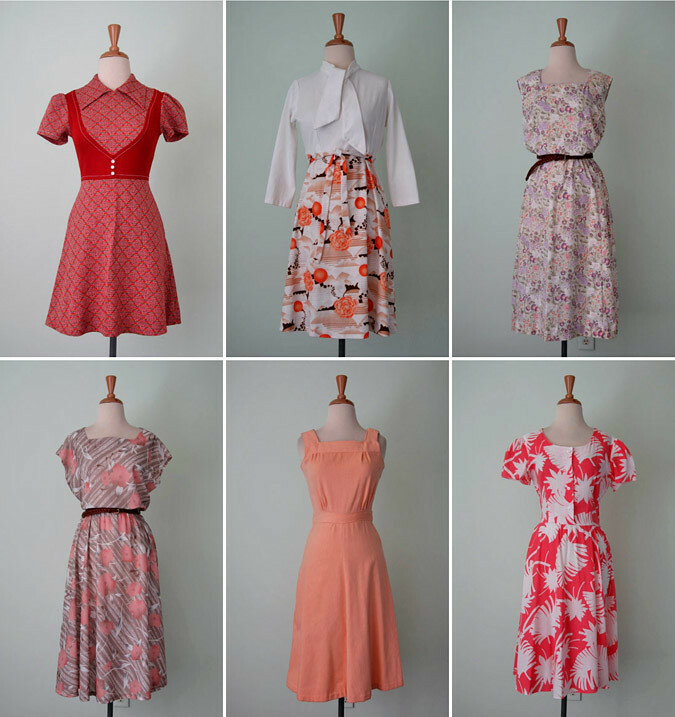 I've just listed all of these amazing dresses in the shop. Believe me, it was hard not to keep some for myself! - listening to: U2 - Achtung Baby "Love is Blindness"
Most of the things on my wishlist so far this month have been boring things like a new laptop. Well, I guess getting a new laptop isn't that boring, but you know what I mean. Fashion-wise I don't have my eye on too much. I guess it's because it's so hot out right now there's not much to be worn except little sundresses and sandals. 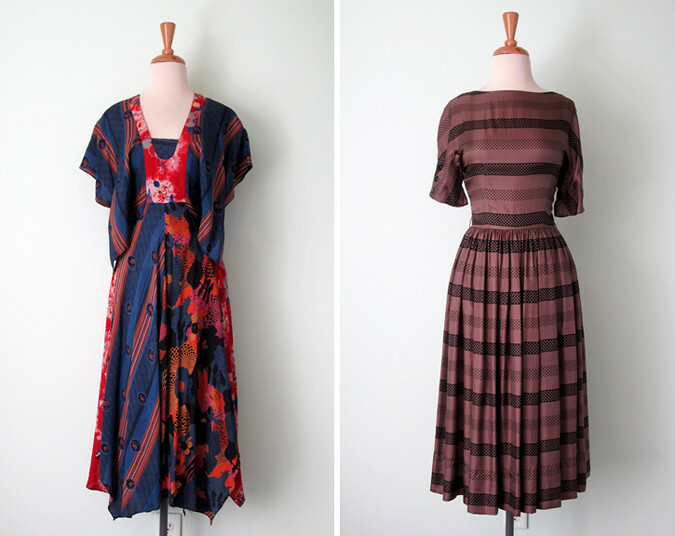 Finding silk pieces is still high on my list and I really like these two dresses. The first is the exclusive Alison Lewis for Target dress. I love that the print was inspired by The Umbrellas of Cherbourg. The other dress is a Built by Wendy one that I've had my eye on for a while and now I'm super tempted by because it's finally on sale. 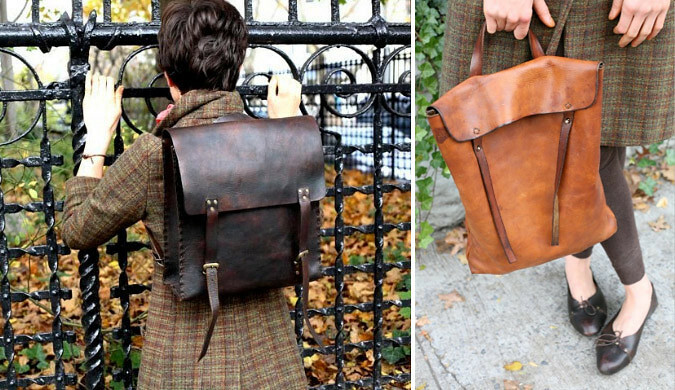 Other than that, I'm on the lookout for the perfect fatigue style jacket to throw on over girly dresses to toughen things up a bit. I like this Topshop one but would like to find an already broken in vintage one if it's possible. And I think I fell in love with these Jeffrey Campbell shoes a bit too late as it seems they've all but sold out in smaller sizes. If anybody spies a pair in a size 6 or 7 give me a holler! Here is a little peek at today's Etsy shop update. I went ahead and activated all the listing and will add the details later tonight as soon as I'm able. Thanks so much for stoppin' by! Tom and I took these photos one day early last week before the temperatures rose through the roof, but I had to keep them under wraps until The Franklin Collection officially debuted on the JessLC site. Jessica was kind enough to send a necklace from the collection to each of the Delightful Dozen gals to style and photograph for her lookbook. 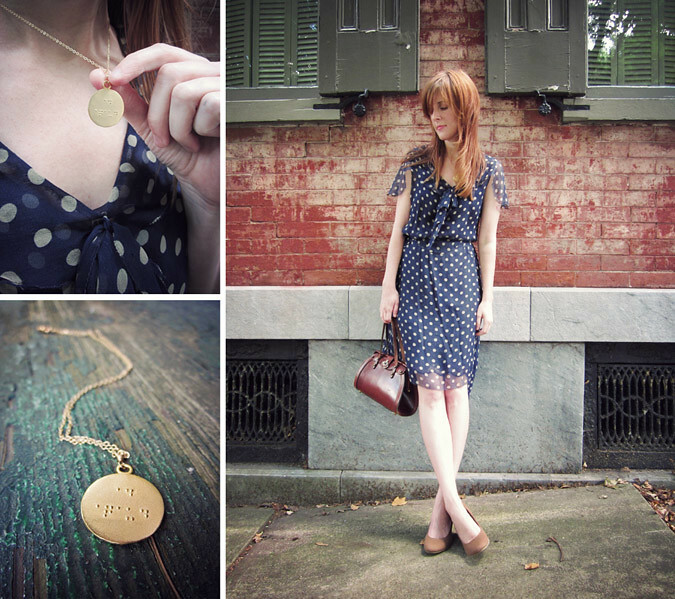 Each of the necklaces is inscribed with a inspirational message; one side in English, the other side in braille. Mine says "Be Brave". I have to admit that I've honestly never worn a piece of jewelry that so many people came up and asked me about. It was quite the conversation starter!